Guests from 32 nations gathered in celebration of the historic opening of the new Church of Scientology in Malmö, Sweden, on April 4, 2009. 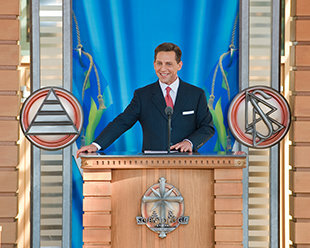 Mr. David Miscavige, ecclesiastical leader of the Scientology religion, presided over the ceremony and dedicated the new Church in the name of a better tomorrow for Scandinavians. Mr. David Miscavige leads the pulling of the ribbon, joined by the Executive Director and honored guest speakers, officially opening the new Malmö Church of Scientology to all. Mr. David Miscavige opened the new European Church of Scientology on April 4, 2009, in the Swedish seacoast city of Malmö. Those in attendance hailed from 32 nations, including Britain, Belgium, France, Germany, Russia, Israel, Iraq and Uganda. They gathered to celebrate a historic day: dedication of the 72,000-square-foot landmark Church of Scientology, acquired, designed, renovated and opened in less than six months. Mr. David Miscavige, Chairman of the Board of Religious Technology Center and ecclesiastical leader of the Scientology religion, officiated at the dedication and opening of the Church of Scientology of Malmö on April 4, 2009. Among those present to honor the occasion were European dignitaries including Dr. Iva Parizkova Ryggestahl, human rights attorney and Vice-Deputy in the Swedish Parliament; Dr. Adly Abu Hajar, Director General of the European Islamic Conference, a group of Muslim leaders of 33 nations; Dr. Gunnar Bramstång, Distinguished Professor of Law, Dean of the Lund Law faculty and author of groundbreaking human rights legislation; and Dr. Bertil Persson, renowned educator, Professor of Religion, and Permanent Representative at the UNESCO University for Peace. “Our ability to uplift generations with Study Technology, our ability to eradicate drug abuse and awaken populations to the inherent moral decency within them—all this is now possible on a previously unimaginable scale. “So yes, today is truly just a beginning and, forever after, let us mark this day for freedom, for Sweden, and for all eternity.” Mr. Miscavige, joined by the other honored guests, then cut the ribbon, officially marking a new era for Scientology in Sweden.